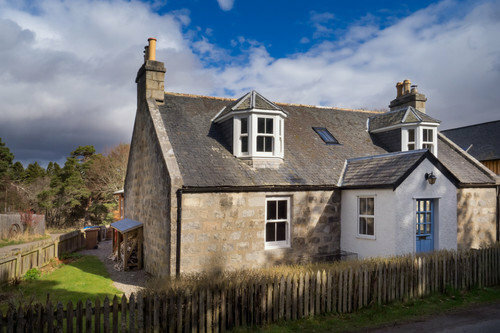 With the dramatic backdrop of the often snow-capped Cairngorm Mountains and surrounded by hundreds of acres of the Abernethy Forest, Nethy Bridge is an unspoiled haven which has taken on the mantle of ‘The Forest Village’. Nethy Bridge remains largely unspoiled since Victorian times with pretty grassy areas, a sense of community and the true spirit of a highland village. The area also annually houses some famous residents - the Loch Garten Ospreys as seen on BBC 'Springwatch'! VERY SMALL - 4 tents of 1, 2 or 3-person size only. Pre-booking always recommended, preferably by e-mail as we are often busy with livestock or in the wood and beyond telephone range. A simply furnished wet-weather shelter that can be used for cooking and candle-lit dining also provides a gathering space for this small tent community when the weather dictates. In fine weather campers can light the chimenea fire where they can sit and share a glass of wine, marshmallows and good stories under the stars. A rare experience is the popular 'Aussie bush shower' hoisted under an ancient willow tree where a single bucket of gently sprinkling hot water proves its worth and the view of the forest, deer and red squirrels is all yours. There's a hammock for lazy days and a 2-person sauna (with music) and woodfired hot tub for relaxing and a touch of luxury after exertions in the outdoors. The Well Being Studio can sometimes be booked for a deep tissue massage from a visiting practitioner.